... at least at for grades 2 through 11. 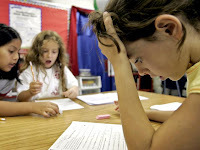 The No child left behind act has allowed researchers to review standardized test results. A careful analysis of the results from those tests suggests there is no difference in scores for girls and boys. They looked at results for California and 9 other states, and no difference was found. In another data set looking at complex reasoning skills gender differences were too small to be meaningful. What needs to happen to keep girls on a science track to make it attractive to pull them through to the next level of science? How do we make it personable, where's the face and social part in the math syllabus at university?